Here at Hampshire Generators, we were recently asked to do a routine service on an 80KVA 64kW SDMO J88K diesel generator in Fareham near Portsmouth. It hadn’t been looked at in a while but it was quite new and looked in good condition so this should be a nice easy local job. We were to change the oil, oil filters, fuel filters, give it a good inspection and then put it on load for an hour or so to exercise it and clear out any carbon deposits. Everything seemed good but when we first arrived and tried starting it we found it just wouldn’t. Then worst of all it started leaking diesel all over the place – we hadn’t expected that. 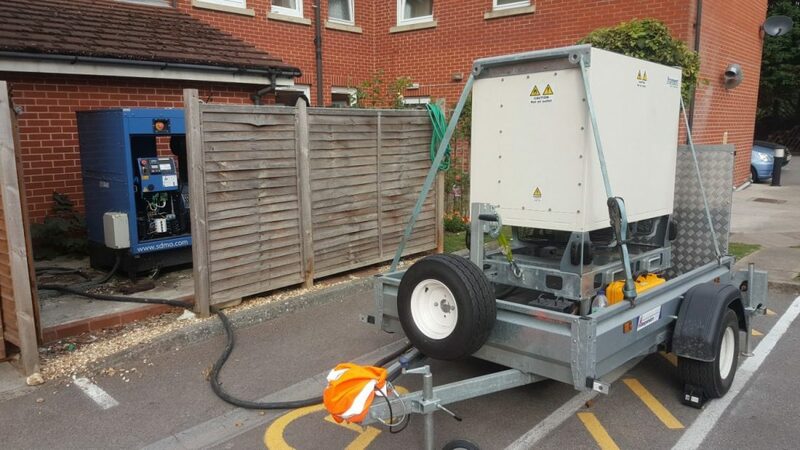 This unit was critical as it was powering a local Fareham / Portsmouth residential care home – losing power here would be a matter of life and death so this needed sorting out. After a little bit of investigation it was found that one of the rubber hoses feeding the fuel to the injector pump had perished (this unit was only 2 years old) and had let air into the system. The fuel had run back to the tank preventing starting and then eventually causing the diesel leak. This was simply and easily replaced, the generator fuel system bled through and the full service and inspection could continue. But it shows that a simple perished rubber hose can mean the difference between your standby generator working or not when it is absolutely needed. The unit was then connected up to our load bank and put through its paces for over an hour; this is probably the first time since testing in the factory and it really does help to reduce carbon deposit build-up, low load running oil leaks and other issues that creep in when generators like this are rarely used. We refuelled the unit with our specially stocked red diesel – www.fuelbox.com – Hampshire Generators are official stockists of these smart boxes; it gives a cleaner burn and has additives to provide a much longer shelf life. Meaning less waste and not needing to replace or ‘polish’ your diesel so often. Obviously, the customer was very pleased that the ‘latent’ defect had been noticed and fixed and now they can rest assured that the patients at the care home are covered during any winter power cuts. Generator Servicing and repairs Fareham / Hampshire / Southampton. We don’t only service standby diesel generators in Fareham, Portsmouth, Southampton and the surrounding area but the whole of the south of the UK – have a look at our generator servicing offers to find out more. Hampshire Generators offer a range of generators, from heavy duty to residential, agricultural to portable. We also stock welder generators, petrol generators and leisure generators too. We are always on hand to help you find the best generators for your needs. Explore our selection or get in touch on 01329 722390 to speak to one of our friendly staff.